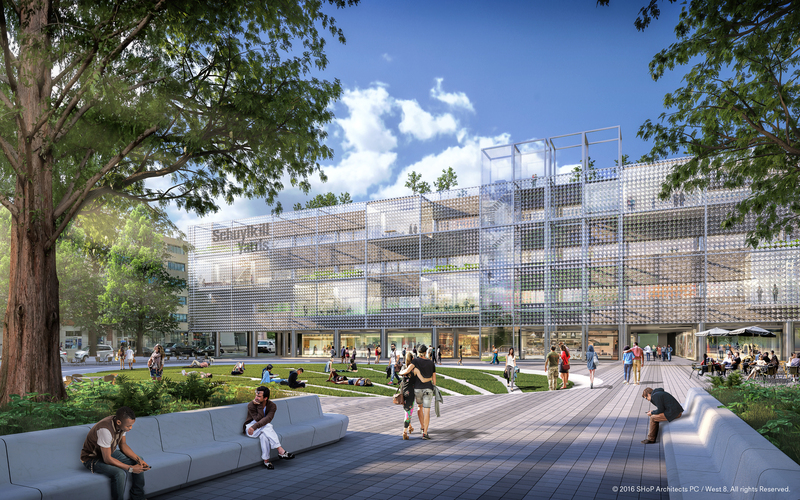 Fourteen acres next to Philadelphia’s 30th Street train station will be transformed into a $3.5 billion “innovation neighborhood” designed to mix education, housing and entrepreneurship, under plans unveiled this week. Schuylkill Yards is the name of the mixed-use project, which will add up to eight million square feet of offices, labs, and housing in new and recycled buildings next to the third busiest passenger rail station in the country. 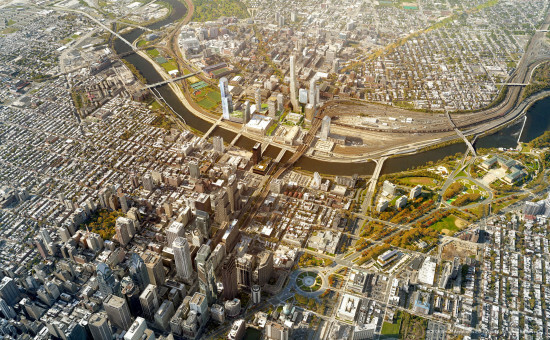 Drexel University, which assembled the land and envisioned the project, announced this week that it has selected Brandywine Realty Trust of Philadelphia to be the master developer and its joint venture partner in the project. SHoP Architects and the Dutch firm West 8 are working on the master plan. SHoP will handle the district planning and development of the architectural standards, and West 8 will be responsible for creating the public realm and development of the landscape standards. 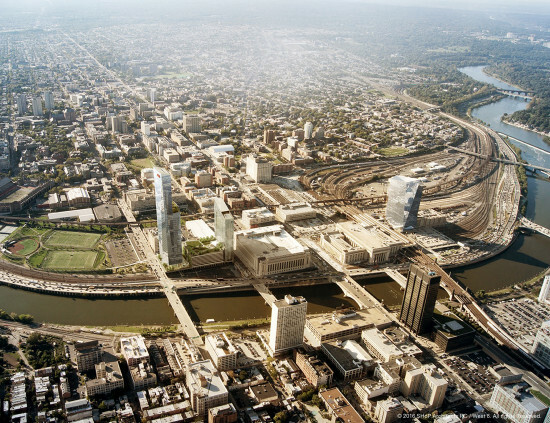 Renderings unveiled this week show a combination of high-rise and low-rise buildings on a 10-acre site next to Drexel’s main campus, Amtrak’s 30th Street Station, and Brandywine’s Cira Centre development. 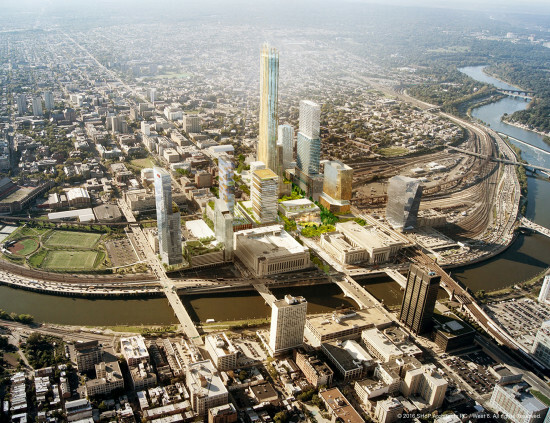 “Schuylkill Yards will undeniably transform Philadelphia’s skyline as new towers rise on the west side of the Schuylkill River,” said Gerard H. Sweeney, president and CEO of Brandywine Realty Trust. Proposed uses in this “collaborative neighborhood” include entrepreneurial spaces, educational facilities and research laboratories, corporate offices, residential and retail spaces, hospitality and cultural venues, and public open spaces. The developers say this is a long-term investment in Philadelphia and its University City neighborhood, and it’s aimed at people who want to live or work in the area and have easy access to the train station. 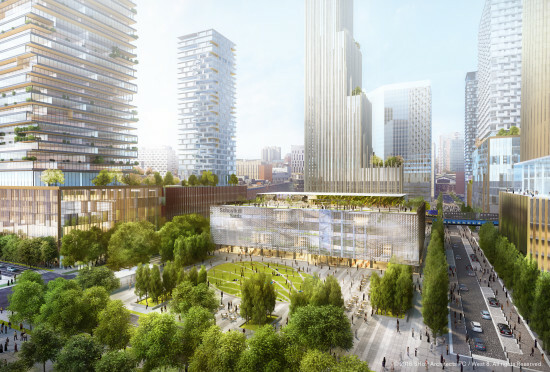 Besides its proximity to 30th Street Station, Schuylkill Yards will have connections to Philadelphia’s international airport. The master plan calls for a new gateway to Drexel and University City, a real estate submarket with a high concentration of education and medical institutions. Construction of Schuylkill Yards will take place in multiple phases over the course of approximately 20 years. As master developer, Brandywine, will oversee a team that includes Gotham Organization leading the residential development, and Longfellow Real Estate Partners leading the life sciences component. Philadelphia Mayor Jim Kenney said the project represents “one of the most valuable assemblages of real estate” in the nation.